The St Francis Dam fails in California, resulting in floods that kill 431 people. Ask most Angelenos what they think of when they hear the name William Mulholland, and they’ll probably mention the curvy road in the Hollywood Hills that bears his name. Mulholland Drive has one of the best 360-degree vistas of the tentacled metropolis: To the southwest, Hollywood, West L.A., and downtown. To the northeast, the San Fernando Valley, and further on, the Santa Clarita Valley—close to the terminus of the Los Angeles Aqueduct, the 233-mile pipeline that first brought water from the Owens Valley to the thirsty city back in 1913. The Aqueduct was Mulholland’s construction, and its payoff—the explosive growth and viability of Los Angeles—has grafted his name onto the prime arteries of the city. Mulholland’s career as czar of the L.A. Department of Water and Power may have peaked with the opening of the aqueduct, but it fell with a tragedy. Mulholland was also the engineer of the St. Francis Dam, a 120-foot high concrete wall that held a reservoir of some 38,000 acre-feet of water. Built snugly into the San Francisquito Canyon, above a scattering of homes and businesses in the Santa Clarita Valley, the dam was completed in 1926 as a safeguard for aqueduct water. On March 12, 1928, just before midnight and mere hours after Mulholland had done a routine walk-through, the dam burst, sending 12 billion gallons of water down the canyon in a 140-foot wave. Within five hours, the flood had traveled 54 miles to the sea, blotting out lives of at least 425 people: farmers, ranchers, water department workers, and their families. It was the second-greatest natural catastrophe in the history of California, and one of the country’s biggest civil engineering disasters. The disaster was national news, with some papers printing partial lists of the names of the dead. At the coroner’s inquest, Mulholland stated that he wished he were among them. And though he was cleared of any criminal wrongdoing—there was no way he could have known the dam was on an ancient landslide, the jury determined—Mulholland retired into seclusion until his death in 1935. But you’d never know all of this. 87 years later, on the anniversary of the tragedy, most Angelenos have never heard of the St. Francis Dam disaster. Until a couple of years ago, I hadn’t. My native Californian father hadn’t until he was an adult. We both grew up less than 20 miles from the site. Over the years, there’s been curiously little done on the part of Los Angeles County, or the city, or the LADWP, to memorialize the victims. Except for some blocks of concrete and rebar and the scars of waterlines etched into the canyonside, there is no indication that the dam once massively stood there. There is a small, weathered plaque at a LADWP power station a little ways down the road, which designates the dam site as a California Historical Landmark, but you have to know where to look for it. There is no official memorial park. No major museum exhibits. No field trips for elementary schoolers. There have been songs about the disaster, but you’ve never heard them the way you’ve heard “Mrs. O’Leary’s Cow.” In one day, hundreds of people died for the water that gave the rest of the city life, yet they have no place in the collective memory of Los Angeles. Looking north on the remains of the dam’s abutment, to where the reservoir used to be. Why forget about the St. Francis Dam disaster? It could be a matter of convenience for the city, whose dealings with water acquisitions are already infamously controversial. Or, sort of like New York City’s 1904 General Slocum disaster, perhaps there was just too much else going on in the years immediately following the St. Francis Dam break for officials to put much energy behind it once the coroner’s inquest had wrapped up. And then, of course, there was the mythos of Mulholland to protect. 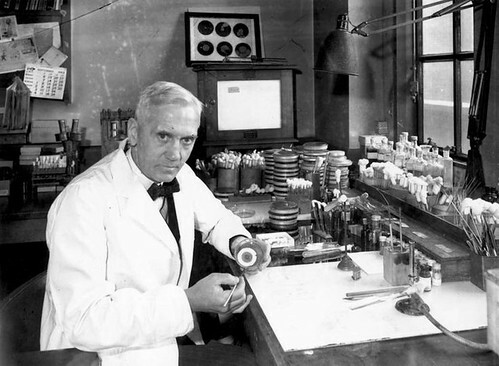 Alexander Fleming notices a bacteria-killing mold growing in his laboratory leading to the discovery of penicillin. Scottish scientist Alexander Fleming makes a curious discovery when he returns to his lab after a vacation. In one of the dirty Petri dishes he had stacked in a tray filled with Lysol—one that had not be submerged in the disinfectant—he notices that mold has grown and that it seems to have killed the staph bacteria Fleming had cultivated in the dish. That intrigues Fleming because for years, he’d been researching the antibacterial properties of enzymes, such as those found in human tears. He wonders if this mold could lead him to developing the wonder drug he’d been looking for. Fleming soon determines that the mold likely floated up in spores from the lab in the floor below him, where one of his colleagues has been collecting mold samples as part of asthma research. They identify it as a mold known as Penicillium so Fleming decides to call its bacteria-killing “juice” penicillin. Fleming, however, was not a chemist and he wasn’t able to isolate whatever was killing the bacteria. He did publish a paper about his discovery in 1929, but it didn’t generate much interest. Then, a worldwide depression dried up funding for scientific research. It wasn’t until 1938 that an Oxford University scientist named Ernst Chain happened upon Fleming’s paper on penicillin. He began working with his boss, researcher Howard Florey, and they found that it cured bacterial infections in mice. Then they tried it on humans, with similar success. The St. Francis Dam in California fails. The floods kill over 600 people. An iron lung respirator is used for the first time at the Children’s Hospital in Boston. Opus Dei (Prelature of the Holy Cross and the Work of God) is formed by Saint Josemaría Escrivá. Sliced bread is sold for the first time by the Chillicothe Baking Company of Chillicothe, Missouri. Sliced bread is sold for the first time by the Chillicothe Baking Company.